Taken from Grace Akhrem Patterns: This cute cabled cowl can be knit long enough to wrap once or twice around your neck for an extra cozy fit. 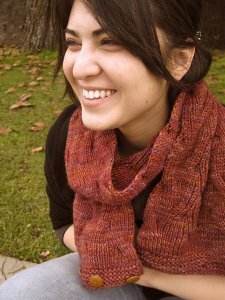 One of our staffers, Ailene, just knit this pattern in Malabrigo Twist and it's gorgeous too. Check it out here. This pattern is from Grace Akhrem Patterns - Reversible Tangled Branches Cowl. Size US 6 & 7 straight needles (or sizes needed to obtain gauge), a cable needle, four 1" buttons, and a sewing needle and thread are required but not included. Finished Measurements: Sm - 25" length x 7" width, Lg - 55.5" length x 7" width after blocking. Gauge: 29 sts & 24 rows over 4". Color Shown is Amber Trinket. $79.50 -- Kit price including yarn only (no book or pattern).